When it comes to saving the world, punching a bear with your fist is sometimes the only way you can get it done. 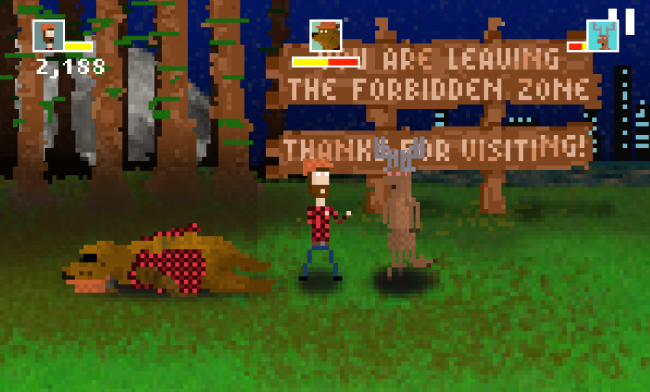 In a new title on Google Play called Fist of Awesome, you play as Tim Burr, a woodsman whose family has mysteriously vanished in a world that is now under control from evil blood-thirsty bears. We all knew this would happen eventually, right? It’s now up to your fists and your epic beard to bring peace back to the land. As for the gameplay, you have a few basic controls. You can move up/down and left/right by sliding your finger on the screen. On the right side are your action controls. You have a basic punch, plus some other jump kicks and upper cuts. Mastering the jump kick will be a good idea, given you move quite slowly across the screen. In terms of enemies, you will be fighting gangs of pissed off deer, as well as countless bear bosses. And they don’t go down easily. The game is $4 on Google Play, but given the work and detail that went into this title, we think it’s completely justified. Go grab it and let us know what you think.